Our online courses help licensees meet the CE requirements by offering approved, current, and easy-to-use courses that are available 24 hours a day, 7 days a week, 365 days a year. Take the continuing education to renew your KS plumbers license today. All of our courses can be completed At Your Pace Online to help you meet the state's requirements to maintain your license. Once you finish your class you will have an official certificate of completion to save for your records. 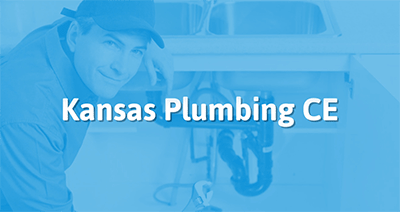 Plumbing Licensees in Kansas must obtain Continuing Education to renew their license and stay up-to-date with new codes and systems in the industry. This 6 hour course has been approved by the Kansas Mechanical Trades Review Board to help you meet your continuing education needs to renew your Kansas Plumbers license. In this course we will cover the significant changes that were made between the 2012 and 2015 Uniform Plumbing Code (UPC). This 6 hour course has been approved by the Kansas Mechanical Trades Review Board to help you meet your continuing education needs to renew your Kansas Plumbers license. In this course we will cover the significant changes that were made between the 2012 and 2015 International Plumbing Code (IPC).